Hello, I’m Anna. Exercise and sport have always been part of my life and have been a great of source of happiness. I was introduced to Pilates in 1999. I had been suffering ongoing back problems, in part from working in the City stooped over a desk, and exercising without proper body awareness and muscle balance. The classes helped look after my aching back but also changed my view of what it means to be healthy. In the fitness industry there is still a predominance around strong muscles and how an exercise is going to make us look as opposed to is it going to make me move and feel better. Pilates gave me huge insight into creating balanced strength throughout the body. As a result, it wasn’t long before I wanted to teach and share my love of the method. In 2004 I completed matwork training at The Place Dance School, London with Hana Jones, Susanne Lahusen and Sonia Noonan. I went on to do my equipment training at The Pilates and Yoga Movement Studio, London with Anne-Marie Zulkahari. Pilates Foundation teachers are renowned for their high standards and comprehensive approach completing a minimum of 1500 training hours over a 16-24 month period. Before moving to Bristol in 2007, I had a studio space at Derby Cottage Clinic in Cambridgeshire. Here I worked alongside Osteopaths and other specialist practitioners. In Bristol I enjoyed working at Simply Pilates in Clifton, and The Mind Body Studio in Westbury Park. After the birth of my first child six years ago, I set up my own studio at home in Redland. Here I work with people of all ages, abilities and fitness and offer private and shared classes of 2 people. As a teacher I have seen the incredible benefits the method has brought to my clients. I aim to create a caring and empathetic space where I can address the needs of each individual client. I try to bring a sensitivity to classes in helping you discover the joy of movement, become more aware, build strength and flexibility and improve your emotional well-being. I believe any person, regardless of age or ability, can benefit from the method and its’ principles. I regularly attend classes and workshops in order to continually develop my practice, deepen my understanding of the body and stay informed. Most recently I have been inspired by workshops with Eric Franklin and in 2018 will embark on The Franklin Method Level 1 teacher training. The method helps you connect with and understand the design of your body through the use of dynamic imagery. Now, thanks to sophisticated brain imaging technologies Neuroscience is proving what teachers and practitioners have known for a long time, that mindful movement and how we pay attention directly affects the structure and function of our brain, our hearts and how we live and move. In my spare time I like to keep as active as possible. I love running and enjoy the silence of running outdoors, swimming, skiing, yoga and meditation. I would love to spend more time learning to surf! I started doing Pilates six years ago when both my Osteopath and subsequently the Consultant Orthopaedic Surgeon suggested that it would help with my calcific tendonitis in my shoulder. I have found doing Pilates has certainly helped me and I have not had any recurring pain. I feel sure that doing Pilates has saved me from having to have an operation on my shoulder. I started doing Pilates many years ago to address back pain, and found it particularly helpful during pregnancy when the body is put under so much stress. Thanks to Pilates, I enjoyed both my pregnancies, remaining comfortable and active throughout, and continue to practice now, some 8 years later. Anna is an absolutely fantastic teacher and has a very calm teaching style and I really enjoy my classes with her. She really tailors each session to my body’s needs. I continue to see benefits from my classes in my body but also mentally as each class I attend is such valuable ‘me’ time. 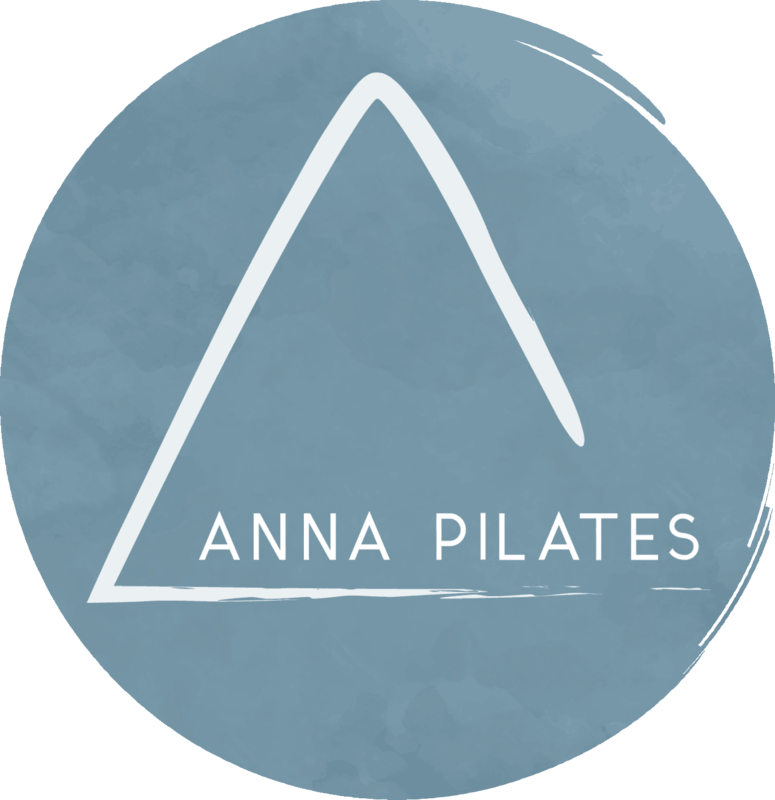 Anna is a careful teacher whose calm and gentle approach is deeply calming, whilst ensuring that even the tiniest precise movement has a huge beneficial effect. I leave the studio comfortable and relaxed and feeling an inch or two taller! I have been coming to Anna’s studio now for nearly a year and can highly recommend her. She tailor makes your class around how you feel on that day and works on all aspects of the body so that all areas have been both stretched and worked upon. Her attention to detail is very reassuring as she is always checking and re-positioning one to make sure you get the maximum out of any position. Her classes are nurturing, fun and not repetitive in anyway. I always feel much better leaving her class than when I went in!